This Bookworm Beat is a true potpourri of all sorts of things I’ve noted as interesting over the past few days. Even I cannot discern a common thread. I didn’t anticipate that my weekend would be as busy as it’s proven to be. It’s almost ten on Sunday night, and my to-do list looks as long as it did when I started it. Sigh. Still, it’s been a good weekend, I’ve gotten a lot done, and I have a few things to offer here. Before I begin, you can see I’m trying out a slightly new format. There’s a long back story to the new format. Suffice to say this new format is easier to produce. On immigration, do as I say, not as I do. The new fence — constructed just inside an existing red brick wall and a wrought-iron fence ringing the historic property — was actually dubbed a “privacy fence” by de Blasio and first lady Chirlane McCray, sources told The Post. “So much for being mayor of the people. That brick fence was good enough for Rudy Giuliani and his family, and for Ed Koch and all the mayors before him,” a law enforcement source said. Sources said the increasingly thin-skinned mayor demanded the extension because he was sick of nosy people in Carl Schurz Park peeping in while he hung out in the yard. Remembering that humor is a powerful weapon. It’s always dangerous to underestimate your enemy so humor that makes people cease to take an enemy seriously can backfire badly. However, humor that exposes an enemy’s true face is very powerful. Events of the last few days, both in my own life and in the news, convince me that Leftists have lost both their senses and their will to live. For any sentient organism to live, it needs two things: First, it needs to have the will to live or, phrased differently, an aversion to death. Regarding the latter, while animals, whether cockroaches, spiders, gazelles, or lions, may not have an existential framework that sees them embrace life, we know that, whether intellectually or reflexively, they will do anything to avoid death. If you want to live, you must want not to die. The second thing a sentient organism needs is the ability to care for itself. Sometimes that care means standing alone, an avatar of sturdy self-reliance. Sometimes caring for oneself means having the wit or the ability to find another to care for you. Babies, with their big eyes, sweet smiles, and irritating cries, are masters of this latter art. The insane, sadly, are often very bad at caring for themselves. Those with some competence may hang around street corners with sores covering their bodies, begging for food, and therefore survive in a marginal way; those with less competence starve to death, aim BB guns at police officers, or find themselves in other situations inconsistent with life. A will to live and competence. Without those, continued life is iffy. With that in mind, I’d like to present some items to you. I’ll start with a phone call I had the other day with another lawyer who is an ardent Progressive and a good friend. I usually find his Progressivism amusing because, both personally and professionally, his every instinct is conservative. It’s just that, being gay, he is marinated in a toxic Leftist soup and fails to recognize the cognitive dissonance that permeates his life. During this phone call, we were discussing various California laws that were put into place to protect home employees from genuine abuse. We’re all familiar with the stories of women brought from the home country, whether the Philippines, Saudi Arabia, or elsewhere, whose employers confiscate their passports and treat them as slaves, without rest or pay, and sometimes add physical abuse to the mix. (This is an excellent article about one such woman.) So California’s laws have a purpose. The “something,” of course, is that the business must either pay the law firm’s straw man client (with at least 50% going to the law firm), or face a regulatory action that frequently leaves the business in bankruptcy. It’s a shakedown job that’s done with full approval and, often, active assistance, from the state’s myriad regulatory agencies. So, to recap: The entirely Democrat-run state of California, at both the legislative and regulatory level, has allowed a situation to develop by which it aids and encourages lawyers who, in true mafia style, shake down small businesses. No wonder my friend was upset. Chelsea Clinton’s recent remarks about the economic benefits flowing to society from abortion are pure, retrograde paganism. Is that really who we are? The other day I did a post about the neo-paganism that seems to be sweeping the more savage parts of the world. I ended with a throwaway paragraph about Chelsea Clinton’s recent comments about abortion. Thinking about the matter, I believe what Chelsea said deserves more attention. Before I get to Chelsea, though, let me do a bit of background about past pro-abortion arguments. For decades, since the lead-up to Roe v. Wade, the Left has always framed abortion as an intensely personal, necessary choice for women.Abortion, we are told, spares them from becoming the pariah status of unwed motherhood — although any negatives associated with unwed motherhood vanished decades ago. Then, still assuming the long-gone ignominy of unwed motherhood, abortion advocates assure us that, without abortion, all those soon-to-be-shunned unwed mothers would end up dead in back alleys with coat hangers protruding from their bodies. We’re also told that abortion prevents women from becoming worn-out baby making machines. The image is of the faded 35-year-old with seven children clinging to her skirts as she stands barefoot, pregnant yet again and, of course, in the kitchen. This argument, which dates back to Margaret Sanger’s time, ignores birth control entirely. As it is, one can buy myriad over-the-counter forms of birth control (condoms, sponges, gels, and foams). There are also all sorts of prescription options, such as the Pill, IUDs, diaphragms, and hormone implants that last for years. Barack Obama made the matter less pragmatic and more emotional when he explained that he didn’t want his young daughters “punished with a baby.” I know that he was focusing on teen pregnancy, but that’s an awfully broad statement to make. You certainly can view pregnancy and motherhood as punishment. Pregnancy is terribly hard on some bodies, labor hurts, and children mean that the mother’s needs (assuming she is not narcissistically focused on herself) always come second. Sleep? Forget about it. Peace and quiet? It is to laugh. Me time? In your dreams. Money? Well, maybe, but not for yourself. Career advancement? Infinitely more difficult. Trump revoked John Brennan’s security clearance and Proggies went insane — and of course, they went stupid, too. All that and more in this Bookworm Beat. Apparently “honesty” and “integrity” have a different meaning inside the beltway. I was one of the millions who appreciated Admiral McRaven’s commencement speech at the University of Texas a few years ago, when he spoke about life lessons he’d picked up as a SEAL. Indeed, ever since then, I make my bed every morning. As he said, you’ll start your day with an accomplishment and, if it’s been a bad day, you come home to a nicely made bed. Those are two solid reasons to make a bed. It just goes to show that, in both Dem world and D.C. world, “integrity,” “honesty,” and “character” have different meanings than they do in the real world. After all, in the real world, no one would say it shows honesty, integrity, or character to lie repeatedly to Congress, but that’s what Brennan did. As reports emerged Thursday that an internal investigation by the Central Intelligence Agency’s inspector general found that the CIA “improperly” spied on US Senate staffers when researching the CIA’s dark history of torture, it was hard to conclude anything but the obvious: John Brennan blatantly lied to the American public. Again. “The facts will come out,” Brennan told NBC News in March after Senator Dianne Feinstein issued a blistering condemnation of the CIA on the Senate floor, accusing his agency of hacking into the computers used by her intelligence committee’s staffers. “Let me assure you the CIA was in no way spying on [the committee] or the Senate,” he said. After the CIA inspector general’s report completely contradicted Brennan’s statements, it now appears Brennan was forced to privately apologize to intelligence committee chairs in a “tense” meeting earlier this week. An apology and an internal review board might suffice if this were Brennan or intelligence leaders’ first offense, but the track record is far from spotless. In 2011, Brennan claimed that dozens of U.S. drone strikes on overseas targets had not killed a single civilian. This remarkable success rate was not only disputed at the time by news reports — even supporters of the drone program called it “absurd” — but as the Bureau of Investigative Journalism and the New York Times both reported later, President Obama received reports from the very beginning of his presidency about drone strikes killing numerous civilians. As Obama’s top counterterrorism adviser at the time, Brennan would have received these reports as well, so either Brennan knew that his claim was a lie, or he is secretly deaf. Similarly, Brennan denied snooping on Senate computers six weeks after Feinstein first made the accusation to the CIA in private, which means either that he was lying, or he had ignored a serious charge against his agency for six weeks, then spouted off about it without any real knowledge — hardly the behavior expected of an agency director. And last year, Director of National Intelligence James Clapper lied under oath to Congress when he told Sen. Ron Wyden (D-Ore.) and the Senate Intelligence Committee that the National Security Agency did not collect any kind of data on millions of Americans, a claim later disproved by documents leaked by former NSA employee Edward Snowden. Despite Clapper receiving criticism from both sides of the aisle, the damage to Clapper’s and the White House’s credibility on intelligence and civil liberties issues and, well, the fact that lying to Congress is a crime (though one that’s difficult to prosecute), Obama has not disciplined Clapper in any way. Brennan is a bad apple and has always been a bad apple, going back to his communist days. Once upon a time, the Left understood this, but Leftists are so infected with Trump Derangement Syndrome that, as many have said, if Trump figured out a way to cure cancer, the Leftists would demand he stop hurting cancer. Oh, and to the extent McRaven, in the WaPo piece, asked to have his security clearance pulled too, I think Trump should oblige him. First, security clearance is a privilege, not a right, and one that operates to benefit the U.S., not the security holder. Which leads me to the second point, which is that McRaven has shown that his years at the Pentagon have warped his values, common sense, and ability to understand the common meaning of words. That’s not a good man to possess to valuable a privilege. Anyway who can look at the hysterical, dishonest Brennan and think he’s a safe man to trust with a security clearance has proven himself too lacking in sense to have his own clearance. He wasn’t. He wasn’t even working for CIA then. He was WH Homeland Security Advisor. He was simply a non essential body in the Situation Room watching the raid. After 2 years of big nothings, reasonable Leftists should abandon the Russia theory, but the Putin-Trump confab recharged the Left’s conspiracy mania. Roe v. Wade needs to be overturned. Abortion is not a Constitutional right. 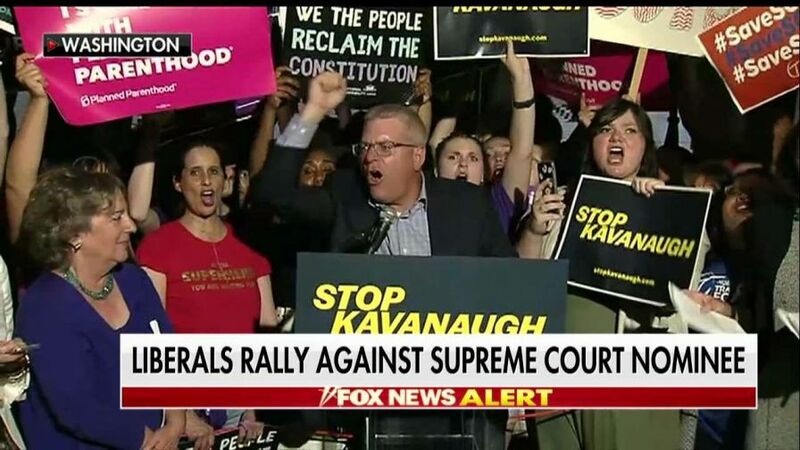 If the left wishes it to be, they need to follow Article V.
A vote to confirm Brett Kavanaugh to the Supreme Court is a vote to overturn Roe v. Wade . . .
Are they right? If Kavangugh is the originalist that his record suggests, then quite likely. In any event, let’s hope they are right. Who controls our country, we the 310 million people through our elected representatives, or five unelected judges ruling at their whim like a politburo, facing no consequences for their assault on our Constitution? No decision has done more to skew our politics over the past half century than Roe v. Wade. The decision was as pure an act of judicial activism as we’ve ever seen. It was at least as much an act of judicial activism as the obscene homosexual romance novel crafted by Justice Kennedy in Obergefell. It was obscene not in a prurient sense, but rather in its assault on the Constitution. When I say “judicial activism,” I mean a judicial invention of a new right declared from the bench in complete contravention of Article V of the Constitution. Let’s go through this step by step. An originalist looks at the time frame in which the Constitution or a particular Amendment was passed. Question one they would ask is whether, when a particular principal was announced, a particular condition existed? So, when the 14th Amendment was passed, were abortions known to society? If so, then the next question is whether there is any evidence that the condition was within the contemplation of those who drafted, debated, or voted upon the Amendment? If the answer is no, that answers the Constitutional question in the negative. If anyone wants to change that answer — if they wish to change the Constitution or add a new right in its Amendments, then their recourse is not to the Courts. Per Article V of the Constitution, an Amendment to the Constitution can only be done by a Constitutional Convention or 2/3rds ratification by federal and state legislatures. Neither involves the Courts. Not even wise Latina justices full of empathy. Period. Following the release of the IG report, people are agog over the FBI’s oozing contempt for Trump and his supporters. You’ll see that “agog-ness” here. Is suicide up in America because our culture is hopeless and deformed? Newly obsessed with a spike in suicide, Leftists argue that Americans are mean. I contend that the suicide spike is because Leftists have denied us hope. The recent suicides of Kate Spade and Anthony Bourdain have brought suicide into the American spotlight. Although an “N” of two is not a trend, the CDC says that there is, in fact, an unpleasant suicide trend in America. According to the CDC, since 1999, America’s suicide rate has increased on average by 30%, with the steepest climbs in the upper Midwest, where suicide has increased by as much as 57%. As someone who has suffered in the past from serious depression, I suspect hopelessness is a significant factor. When you’re deeply depressed, not only are things bad, they are hopeless. Moreover, from the depressed person’s point of view, they will never get better. Nothing will change. The depressed person knows deep inside that grim, dark, and awful is a permanent, unchanging condition. That’s why it doesn’t help if friends say things such as “You just have to get through this bad patch,” or “If you would (get a new job, get out of a bad relationship, etc. ), you’d feel better.” Anything that friends tell the depressed person in an effort to steer them away from that blackness is premised on hope. Part of depression, though, is that hope is a delusion. The reality is that it is absolutely inconceivable that things will get better. I’m fortunate in that I was never depressed to the point of feeling suicidal. Instead, I was a slogger. I slogged through may day, doing what needed to be done, but was deeply unhappy. Moreover, I was unable to make changes that would have increased my happiness because the depression told me (quite falsely) that change was useless. Nothing would improve . . . ever. Fortunately, the three times that I found myself in one of those dead-end funks, external events happened that forced changes on me. I graduated from the school in which I was unhappy, I recovered from a serious illness that made me unhappy, and a different serious illness allowed me to step back from a job that made me unhappy. In other words, I was always the lucky recipient of a deus ex machina event that broke the depression cycle. I’ve sometimes wondered how things would have ended up if I hadn’t had an external force to save me from Churchill’s “black dog.” I’d like to think that, like Churchill, I might never have quite abandoned that little spark of hope that keeps one going, no matter how bad things get. In that regard, one of my favorite Churchill quotations comes from a time when he was struggling with depression. As I heard it, he was at a dinner party and, instead of talking to the young woman seated next to him, spent most of the dinner staring unhappily at his plate. Suddenly, he turned to her and said, “We are all worms, but I do believe that I am a glow-worm.” No matter his mood, he never lost faith that he had something to offer. Others, however, lack that little spark, whether because of nature, nurture, or whatever else combines to make each individual’s psyche. For those people, the thinking is brutally clear: if nothing will ever get better, if life will always be, not just hedged about with failure and isolation, but also drab, pointless, and meaningless, why live? All of the above describes individual hopelessness. This essay asks whether there be societal hopelessness too? In the battle for California governor, a surprisingly even-handed pro-Gavin Newsom flyer makes an incredibly strong case for voting for Republican John Cox. In an ideal world, on June 5, when California voters go to the polls, members of the various political parties would have a chance to select which of the candidates affiliated with their party should end up on the ticket in November. But we do not live in an ideal world. We live in California, which several years ago chose to become an “open-primary” state. What “open primary” means is “no primary” — party members cannot choose their candidate. Instead, an open primary is a “pre-election election,” with the top two winners facing off against each other in November. As I detailed in a post dedicated to the whole misbegotten scheme, the purpose is to remove Republicans entirely from the California ballot every November. Sometimes, though, even the best-laid Democrat schemes go awry. In this case, two factors are creating the serious possibility that the Democrat front-runner, Lieutenant Governor Gavin Newsom, will find himself running, not against a less popular Democrat, but against an actual Republo-Libertarian, businessman John Cox. The first factor behind this unexpected scenario is that there are a ton of Democrat candidates, ranging from hard Left to harder Left to hardest Left, and they are literally tearing each other apart. While Newsom will undoubtedly end up on the ballot’s top spot, it appears that the other Democrats will divide the vote so much that none will take second place — which leads us to the second factor: The mini-conservative rebellion in California seems to be consolidating around John Cox. I have to admit that, of the two top Republican candidates, I prefer Travis Allen. This is not meant as a cut at Cox, whom I’d be very happy to see in the California governor’s mansion. I just like Allen’s energy more. The numbers, however, seem to be supporting Cox, which is, I assume, the reason why Trump just endorsed him. I don’t see Trump’s endorsement as an actual personal preference for one candidate over the other. I think he’s being a pragmatist and is throwing his weight behind the candidate currently most likely to prevail over Democrats other than Newsom for a spot on the November ballot. A Proggie-run first aid class reveals the shocking level of ignorance, innumeracy, and illogical thinking behind their anti-Second Amendment stance. In terms of first aid, this class was time well spent. I’m now up to date on conducting a basic examination on a conscious or unconscious person, using pressure or tourniquets to stop bleeding, making slings out of anything handy, doing CPR, and using an AED. As always, I hope that I go several years without having to put into use the skills I learned. But all was not perfect in this friendly and helpful class. The subject of gun violence came up several times and both the teachers (MDs, RNs, and EMTS) and the students showed really shocking ignorance and a complete lack of logical — and perhaps moral — thinking on the subject of guns and death in America. My past California-based classes have always revolved around specific emergency scenarios: earthquakes, fires, car accidents, and every day emergencies, ranging from heart attacks, to drowning, to accidental knife wounds. This time, though, the teachers said that the single most important emergency we can prepare for is a mass shooting, as well as generalized shootings, because guns are the primary danger facing us. “When was the last school shooting?” a teacher asked, clearly expecting people to talk about the Valentine’s Day mass murder in Broward County Florida. But this is Marin and the class knew better. A moment of silence, before someone called out her best guess. How does one begin to unpack all the fallacies, innumeracy, and illogical thinking in the above interactions? Fallacy #1: For a first aid class, mass shootings are currently the most important thing to need to prepare for. The claim that our greatest risk in Marin comes from guns is so very wrong and to worry about our schools getting shot up is so paranoid. There are two things going on here, one of which is the likelihood of an event occurring and the other is the magnitude of the event should it occur. Take earthquakes, for example. It is true that earthquakes happen infrequently even here in California, so maybe we’re being overly cautious preparing for one. But the thing is that we know, we absolutely know that a big one will hit here in Northern California, and when it does, it will make a mass murder look like small potatoes. If we’re preparing for unlikely, but possible events, we should definitely be preparing for that earthquake — although it’s good to know that the same skills will apply to other unforeseen events, including that unlikely mass shooting.